Opened by Run, Sept. 16, 1983. 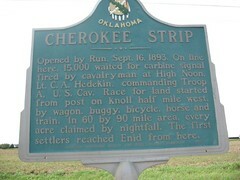 On line here, 15,000 waited for carbine signal fired by cavalryman at High Noon, Lt. C. A. Hedekin, commanding Troop A., U.S. Cav. 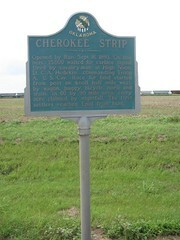 Race from land started from post on knoll half mile west, by wagon, buggy, bicycle, horse and train. In 60 by 90 mile area, every acre occupied by nightfall. 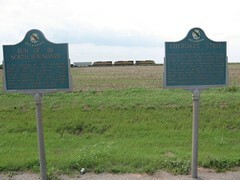 The first settlers reached Enid from here. * Directions and information from Mark of Heritage, by Muriel H. Wright.